For those trying to keep up, here's the most recent updates! If you saw my last post, you'll know that I'm now the head of the Anime World Artist Alleys. We've got some spaces still open for the Chicago show, so if anyone who reads this is interested, please contact me via artistalley@animeworldexpos.com. I'm still arranging all my information, so I probably won't be able to reply to anything yet until around Monday afternoon. Oh right. We're getting the keys to our new Townhome tomorrow. Right. Yeah. So this'll be the 3rd time we're moving in 3 years. I'm SO SICK OF PACKING. On the bright side, we barely unpacked here (since within one month we knew we weren't staying here past the lease, so what was the point?). Thankfully we don't have to be fully out of the current place until the 25th, so that gives us lots of time to move everything. This was a picture I took on Friday night when I was HOME ALONE and working on drawings. WHY DO THEY ALWAYS TRY TO KEEP ME COMPANY?! 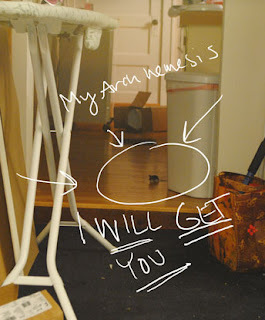 On top of these, we also get house centipedes *shudder* and the occasional ants. It's like the house is TRYING to kill me to make me leave. Oh well. 2 more weeks. TWO. I'll have further devleopments on this after Monday. If I'm brave enough. It's a big deal for me, sooooo... just wish me luck right now. Wow. What a crazy week. For those of you just joining me here (HI NEW PEOPLE! ), I found out about a couple of weeks ago that Anime World Indy had an opening for their Artist's Alley. And me, liking to get out and meet people and sell my art, I took the opportunity and signed up for the show! And now we're back! And WOW we're tired. I also have a few more updates, buuuuuut those'll wait for a little bit. So, to start my story, the weekend before AWI, we were VERY busy. 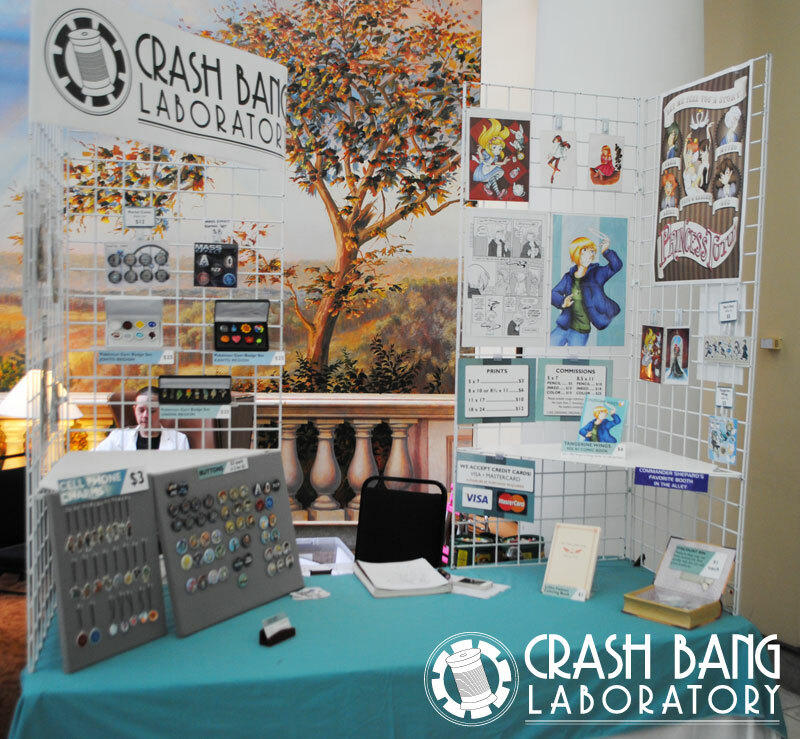 Between guests in the house, Shutocon Alley sign up, a family birthday party we needed to be at, we had to finish making some products to go in the booth. Spending a large chunk of the week making some new Pokemon badge sets, (I was out of Kanto Region sets), I ended up coming down with an annoying cold on JULY 4th. My one day off. I spent most of that day dead on the couch, and I had to take Thursday as well to recover. Since we were trying to save money, we left Friday morning at like 5:30 am. We watched the sunrise as we drove (I was shockingly awake for most of the drive). We arrived at the hotel around 11, and started the whole check-in process. Got our room, then went to search out the hotel for AA sign in. EGADS. This hotel is NOT set up for things like conventions. They had a ton of rooms, and the scenery was really pretty, but the hotel made a bit "L" shape. So the panels, events, and reg were up on the second floor and the dealer hall and the alley were downstairs after the restaurant. I liked all the spaaaaaaaaaaaaaace! The dealer hall was in the big room downstairs, and behind that, were the artists. I was able to nab a fellow vendor and found out where the check-in process was. Our table was midway down the hallway (I'd say there was like 10ish artists total, which is pretty good for a small starter), and we had a HUGE amount of space behind us. Which was lucky for us, since Dave caught my cold, and he was battling unconsciousness a lot. I was also battling being able to breathe through my nose all weekend. WHEW. Anyway, Friday was pretty slow. Which, to me, is very typical. You won't see a lot of sales on Fridays as everybody's still browsing and figuring out where everything is. And since this hotel had a bit of a learning curve, they were gonna take a while. Met some lovely people, made friends with the booth across the hall from me. (HI KIRA) I see her at a lot of other conventions, so it was nice to finally catch up and chat during downtimes. It seemed like they were having a staffing problem, and they were desperately trying to get attendees to go in one door, and out the one near us. The Enthusiasts were also located near us in a further away nook. So hopefully they got some traffic too. I liked how we had it set up this time, so I took a picture so I'd remember! Closed down around 6 pm, went out to dinner, and then Dave took me to the CONTAINER STORE, which is the greatest store next to Ikea. And I'm sad it's not in Michigan. If you don't know me, I love boxes, containers, bottles, whatever you can use to compartmentalize things. Got back to the hotel, and decided that I was up to going to the Formal Ball. So I donned Princess!Rue, and headed out. 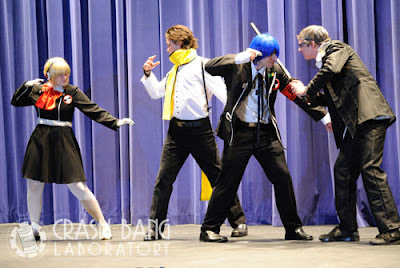 And while there weren't a LOT of people there, I happened to have liked it 10x better than the one I went to at ACEN. At least this one had danceable music. THEN we decided to sleep. Whew. We were tired. Saturday, got up, got dressed in Pascal for fun's sake, and headed downstairs to the alley. Turns out a few of the other artists moved into the front hallway. This confused me a lot, I'll admit right there. 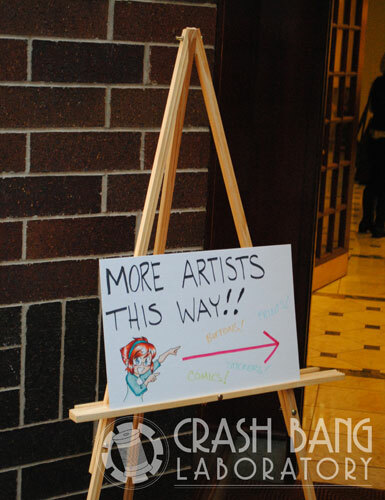 So I drew us a sign that said "MORE ARTISTS THIS WAY" directing people to come find us! I unfortunately did not keep the sign. It was gone by Sunday morning after we all moved. ALAS. But I'm stubborn. I liked my hallway, and I'm of the mindset that moving one's booth will only confuse the customers. So several of us stayed throughout the day. I talked to a LOT of people, sold a decent amount of things, and got my picture taken at the Enthusiasts, which was loads of fun. I can't wait to get my shotstaff done to get more. I did not go outside. It was clearly made of lava, and I did not want to melt. Stayed at the booth all day, and my predictions came true when traffic picked up around 12:30-1:00. I figured everybody had to wake up, and/or register in the morning. I did a little bit of shopping in the Dealer hall, got myself some cute little Witch figurines from Madoka Magica. They're so adorable, so I put em with my Petit-Nendoroid figures. I'm gonna need a special shelf for them in my art cave when I finally get it set up. By the end of the day, we were both exhausted yet again, and packed up, and headed out for dinner and a movie (we saw Spider-Man, which was okaaaaaay, but not great. I blame the fact that Marvel did not have a huge hand in it like their other movies). Got back, and crashed out on the bed. Slept deeply. Sunday was.... special to say the least. For those confused on why we were out in the hallway, when Dave and I got down to the booth, it turned out everybody else had moved their tables into the front hallway. Leaving just myself and my alley friend across the way all alone in this big hallway. We worked out what happened with the Vendor DH, and she was very understanding of my issues with the whole thing. The staff ended up handling this very well after the debacle, and I appreciate their sympathies. Thank you to those who stopped by on Sunday, as I'm sure you were very confused at the move. Overall, I enjoyed myself at the convention, and would definitely return. 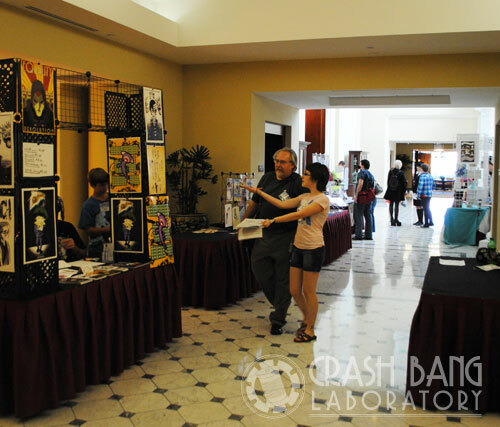 I got to meet a lot of great convention staff (from this and other cons nearby), and did tons of networking. Despite troubles with other vendors in the hallway, I've learned a great deal, and I'm hoping to volunteer my services as an AA helper (Dave wants to as well). 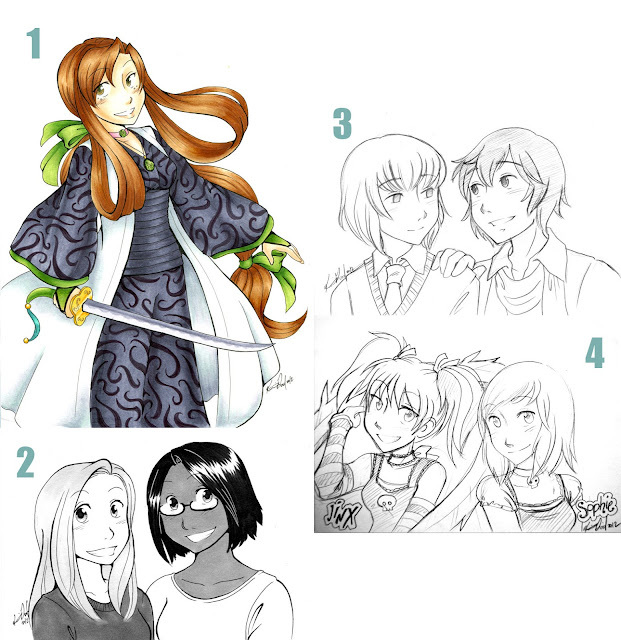 Here's examples of some of the commissions I did this weekend! Most of these are original characters / photo portraits. EXCEPT for #3. They're from a game called "Hatoful Boyfriend". Which is a game where you are in a school full of pigeons. And it's a dating sim. I took like.... no photos. I'm sorry. I was so busy. Perhaps at next convention I'll have better ones for us! 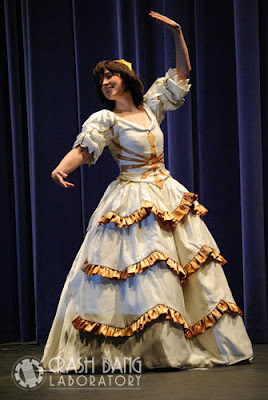 New Convention: Anime World Indianapolis! Woah. 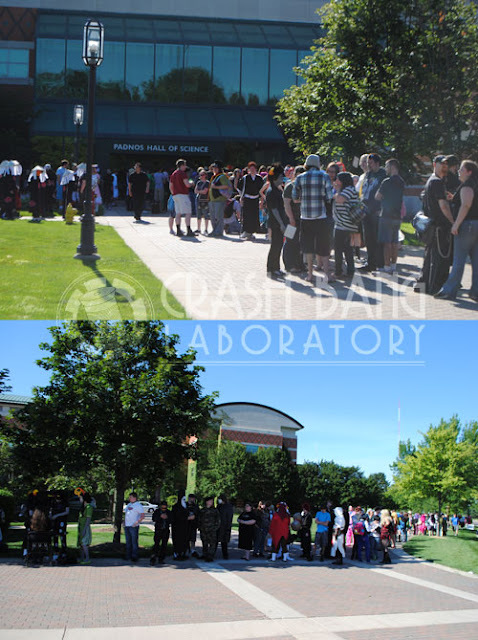 Things have gotten busy in the last week here at Crash Bang! After JAFAX, I had a friend come out to stay and sew for part of the next weekend, as well as a party I had to go to for family. THEN I also discovered I had received an email from a brand new convention, Anime World Indianapolis indicating that they had an opening available in their Alley (I had been on their waitlist), so I scrambled to get that ready. Then realized I sold all my backstock of badges on Etsy, so we've been working on finishing that. We're making fabulous time, and I'm REALLY glad the 4th falls in the middle of the week, as it will give me time to finish all this stuff. I'm going to try making prints. :-/ I know I'm not a big fan of fan art, but we'll see how far I get. I don't want it to be a frequent thing with me, but until my comic gets more popular (i.e. i get more time to draw it), I'll have to have some fan art floating around. OH, then on top of that, I finally watched all of Legend of Korra. It was amazing, and I look forward to the next season. So onto my topic at hand: ANIME WORLD INDIANAPOLIS! 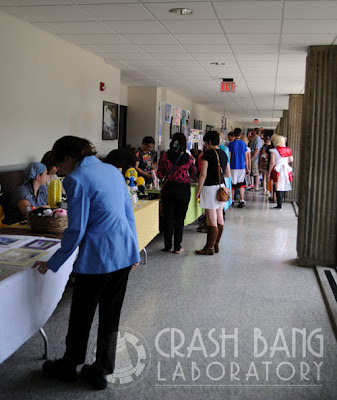 It's an Anime Convention! NO WAY. For long time readers, you may remember that we went to Anime World Chicago last year (and are planning on it this year too). This convention happens to be organized by the same people/business/whatever, it's just in Indianapolis! I'm tend to be a little nervous about first year conventions, especially one that takes place at a moderately expensive hotel (it's like 119 a night), however, they have had a lot of advertising. And the group that runs the other one is really professional. The word is out that it exists - I mean, their FB page has over 6,000 likes alone, so it's not like anybody hasn't heard of it. Indy also tends to be geek central, heck GENCON takes place there. So hopefully some people will show up, and I can draw pictures for them! 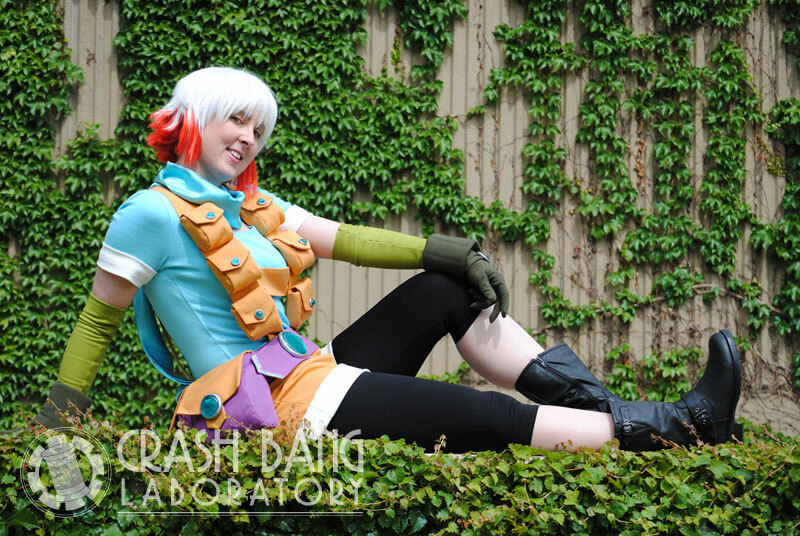 Sorry that I've been absent a few days on the blog here - but I was busy prepping for JAFAX and then another convention appeared! 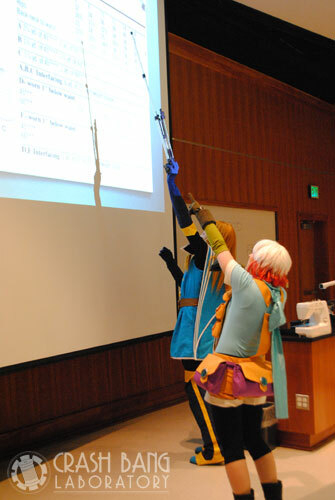 For those unawares, JAFAX is the anime convention/expo held every June at Grand Valley State University. It happens to also be the place where I first started doing conventions, artist alleys, and cosplay, so it's got a special place in my heart. So here is the recap of the convention! Friday was a nice relaxing day. Since the convention is only 2 days (Sat-Sun), we didn't need to really get there until the evening. Which was good, cause I was busy trying to finish my Pascal costume up for Saturday. Also, we weren't running the cosplay events this year (I had since retired as of last year), so I didn't have too much to worry about preparing. Did some cleaning, and got all my bag suspender thingies ready to go. Took me a total of like 4 hours, but I think they came out pretty well! They were "good enough"! and we packed and was off. Which was a total failure to launch. It took us almost 4 hours to GET to the Grand rapids area, which is absolutely RIDICULOUS. We hit like 3 traffic jams on the way, one taking us over 45 mins to get through. Stopped by the site just to say hi (I just had to finish editing some panels that night so I was in no rush). Learned that stuff was gonna be set up a bit differently before. Namely, I was wondering where the crap the vendors went! Vendors got moved, so I'll talk about that in a bit. Got to cow-hotel (it's in like the middle of nowhere), checked in, wrote the rest of the panels, and then went to sleep. Or at least tried to. Now that I have an awesome bed of awesomeness... those hotel beds just don't cut it anymore. So I was a tad tired in the morning. We got up decently early, dressed, and headed out to the convention site. The line was reeeeally long as usual, so Dave and I decided to loiter around with Sil and Amanda and just people watch, take pics, and decide what we wanted to do. It was a long line. My pictures won't really do it justice. 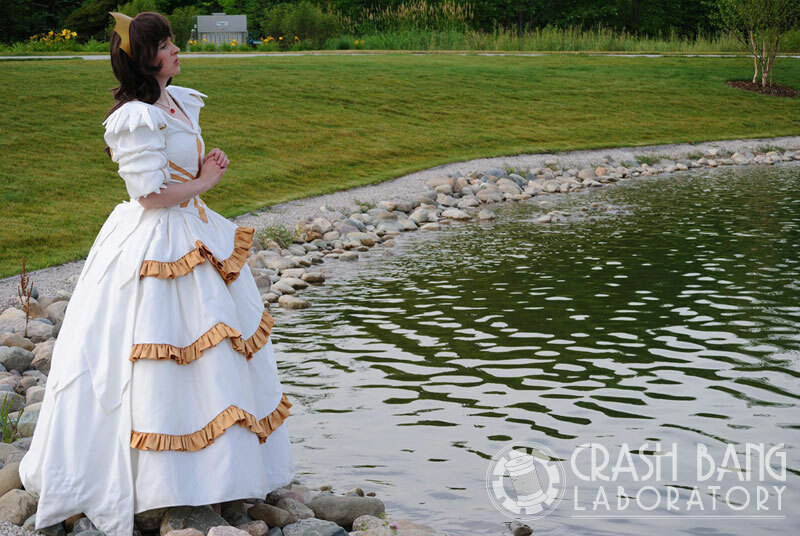 We checked in with the new cosplay coordinators, and they seemed to have everything handled on their end, and I could not be more proud for them. So I signed up for their fashion show (cause I could :P) and then went on my merry way. I had learned the dealers were going to be in the same hall as the artists, so we just waited for the show to open, and then walked over to Mackinac. I really wanted to shop the AA first, and since dealers were there too - we shopped way ahead of other people! It was nice. I did not get as claustrophobic as before. (It was really bad in years past when it was all stuffed into Padnos). Each of those doorways held about 3 vendors. 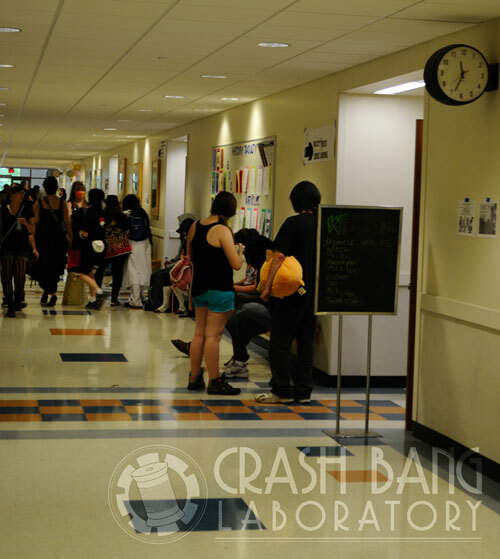 This year, they put them down the hall where the classrooms were in the "moderately new" area. In each of the large classrooms they'd have 2-3 vendors, and I think the set up was really nice in keeping the hallways clear of congestion. Which worked REALLY well. Only downsides to this set up was that even early in the morning, there did not seem to be enough A/C going around, and they got hot and partially smelly (not as bad as ACEN con funk hallway though). The hallway went on for a long time, but this was all I could see. Alley was packed due to people/location. 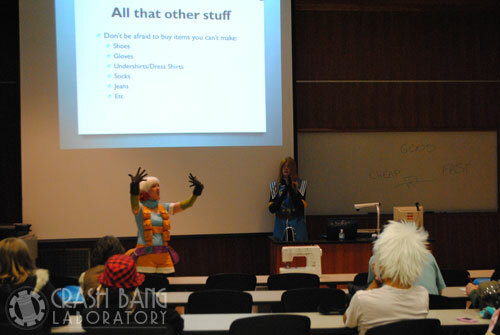 Saturday was pretty busy for us here at Crash Bang, as not only was I derping it up as Pascal, Dave and I were giving panels about cosplay! What was even more amazing is that they gave me one of the friggin LECTURE HALLS. How awesome is that? It was like, the biggest screen I ever had. 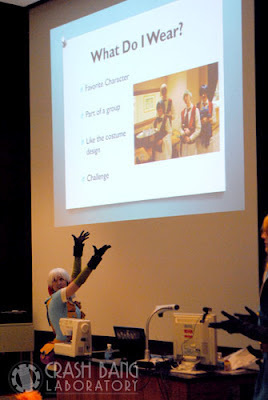 Sil was kind enough to take some amazing pictures of me talking to a crowd. I almost look like I'm an authority on the subject! Having Jade around helps too. I was too short to point to the screen. I had not anticipated it's size! 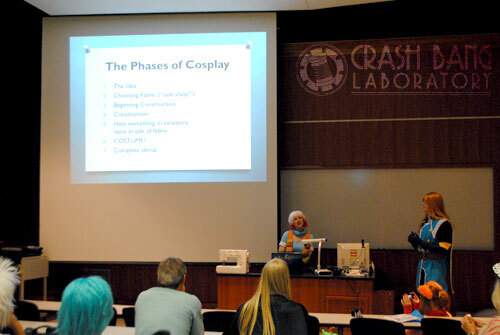 We gave two panels, our beginning sewing panel and our cosplay level up! panel, which kind of amounts to me griping about people's stuff not fitting them right and how to fix it. :) Okay, not so much of griping, but more advice to make sure you don't look bad in pictures. It was suggested I make some videos about this. I am considering it (once I have extra time) - and having them linked to on my website! Sound fun for anybody? Please, let me know! After the panels, we went out, roved, took pictures of cosplay (which I'm STILL going through), but here's a preview! THEN (I told you it was busy) I changed into Princess!Rue at the Performing Arts Center (PAC) and participated in the fashion show. Wide angle lens is awesome. I need to get one of my own. Took a few more pictures, then went back to the hotel and changed so we could run out and see Brave that night. Which was a cute movie, and I'm glad I got to go see it. I was awful tired, so I had no problems falling asleep as soon as I got back to the room. Sunday was catching up on any shopping I had left to do. Spent the early hours traipsing the alley, bought a couple of things, as well as in the dealer hall. I continue my quest to collect all the Madoka Nendoroid figurines. They are so friggin cute and VERY well painted/made. I was skeptical of the $12 price, but gosh, they're worth it. I did get a duplicate of one of the figures. I'll make a post in case anybody wants to buy it. Kim doesn't look all that impressed. C'mon man, I saved the friggin' GALAXY!! 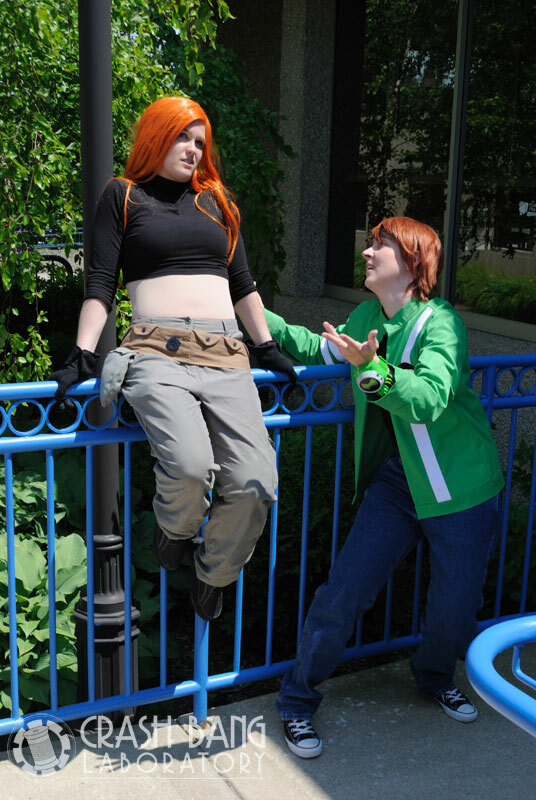 Sunday I was dressed as Ben Tennison for fun, and Sil was Kim Possible (and yes, I am indeed working on a Ron. mwahaha). Got quite a few looks and pics taken, which was fun. We ended up heading to the Maid Cafe to bother Amanda get snacks and rest in a nice quiet A/C filled location. I had the chocolate cupcakes which were AHMAYZING (even though I could only eat one) and I totally put way too much lemonade powder in my drink, but that's okay cause it was FUN. The Waitstaff. They were so awesome. They may have coerced me to come back to JAFAX next year, if only to derp it up as Cafe Kichijiouji de. 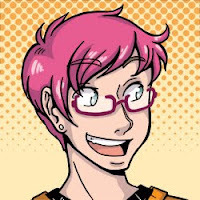 They apparently will allow crossplay. Afterwards, we headed out to get some pictures in the blistering heat, and around 3:30ish I was starting to get dehydrated, and decided it was time to go home! Drove home in record time, and made it home early enough for dinner, rest, and some drawing. Alley was still very crowded, but it's better to have them in hallways rather than classrooms. 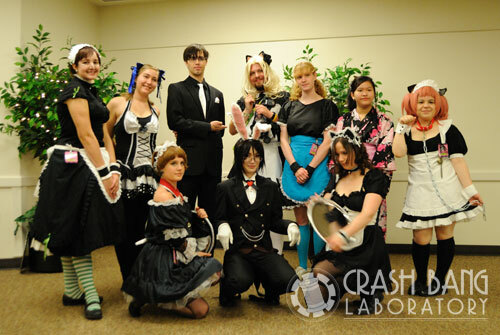 Maid cafe was good, I hope to help out next year. Maybe i'll do panels again next year. We'll see. 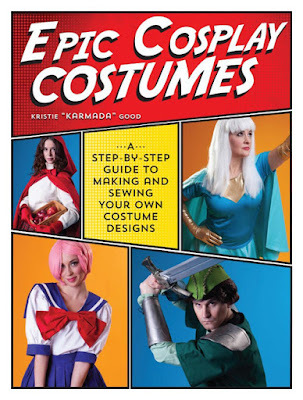 NEXT UP: OMG ANIME WORLD INDIANAPOLIS. They had an opening in their Artist's Alley, and held it for me. Updates coming soon.